Chloe is a 6 yr. old female, Cricket is a 9 yr. old female, Howie is a 3 yr. old male. Chloe loves to snuggle, Cricket loves to wrestle on the bed, Howie loves to ride in the car and play with toys. My miniature schnauzers love my homemade peanut butter biscuits. Their favorite game is to wreck my bed as soon as I walk out the door. I'm pretty sure they wrestle on it because whenever I come back it's a mess and the pillows are all over the floor. Is Howie socialized and neutered? I'm I m looking for a salt n pepper male. 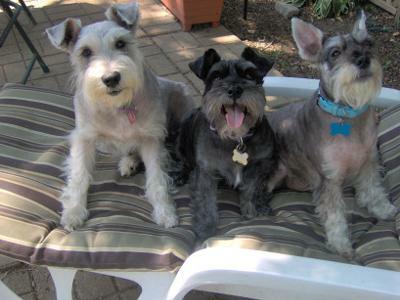 What's better than a Miniature Schnauzer? You have a really cute family!